The theme entries are pleasingly arranged, snaking from the NW corner down to the SE corner. The song is a good representation of the anagram entries as well, and six solid anagrams is impressive, even if three of them are plurals. The problem with artist/song tributes is that if the solver is not familiar with the song, the reveal may not be as satisfying. Yesterday’s “Space Oddity” puzzle worked great for me because I knew the song well. Today, I have to admit that I got the revealer after thinking of Flogging Molly’s cover and remembering that it was, in fact, a cover. I know it’s a famous song, and I can’t argue about its age because “Space Oddity” is only five years younger, but it didn’t jump out at me. The fill has a lot of constraints given the sheer number of short theme entries, so I can’t really fault the puzzle too much for ATNOS and the partial ILE DE (France). TWITTER and the Women’s World Cup win by the USA team are fresh entries, but things seem to skew more towards history and pop cultures of the 1930s-1960s (Lash LARUE, SMOOT-Hawley Tariff Act, SDS). On the other hand, OTTERS are otter-ly fascinating, and long down entries IN THE MOMENT and INDIGO GIRLS are lovely. Overall, a well-laid out theme with decent fill despite the puzzle’s constraints. Tread carefully when you’re around Greg Johnson, our constructor today, because sources tell me he’s had it up to here. Case in point: 51D. 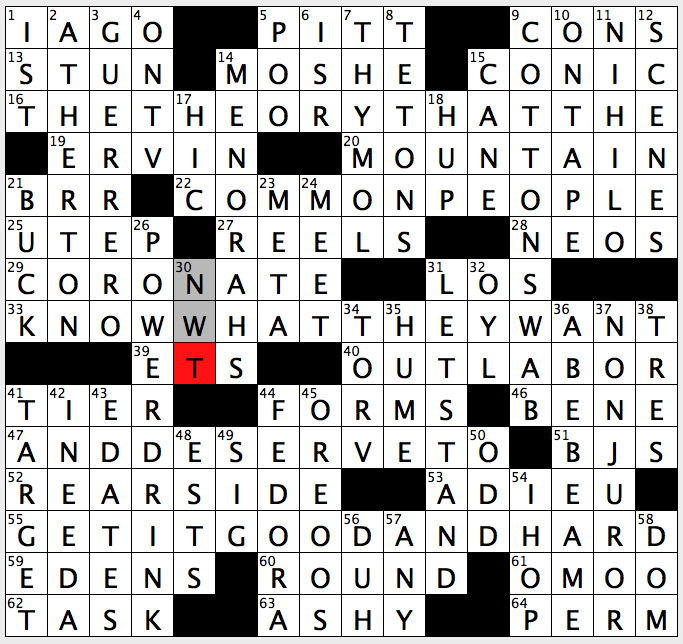 He flat out tells us he’s [At one’s limit, and a hint to this puzzle’s starred answers]. Yup, he’s FED UP. Not only does he tell us there, but he secretly put FED going UP in five other entries. Poor guy! 31D [*Excluding] ASIDE FROM. A bit of a blah entry to start with, but as it’s at 31D, it’s not really the first one you come across. 4D [*Chirp from R2-D2, e.g.] SOUND EFFECT. That’s better! And an evocative clue, too. 21D [*Expo] TRADE FAIR. Solid. 25D [*Card game that’s French for “railroad”] CHEMIN DE FER. Fair? Or not fair? This was completely unknown to me, and I needed every crossing. Tough one, but I got there in the end. Didn’t get much joy out of it, though. Interesting choice when ILE DE FRANCE, PARADE FLOAT, or TOUR DE FORCE could have gone right in there. 12D [*Did some mugging] MADE FACES. Great clue and answer! I find it very curious that he stacked pairs of 9s in the NE and SW, two of which are themers, two are not. The two that aren’t (SWIPE LEFT and PUT IT DOWN) are arguably more interesting than the themers. Typically, in this situation, a constructor would move those themers in one column and extend the black blocks in from the side to eliminate this stack (and thereby make it easier to fill). But Greg challenged himself with this configuration and came up with a winner. It’s a very clean grid despite that challenge. I’ve noticed Greg’s grids are usually at a high standard and this one is no different. Look at all this good stuff: BEATS ME, RAN AWAY, SWIPE LEFT (nice, modern addition), EGG HUNT, MILANO (sadly, not the cookie), FREEDOM, PUT IT DOWN, IRON MEN, and SARONG. I even like ASTRIDE, ALFREDO, and AMNESTY. SHANDY is a great entry, too, but I immediately plunked down RADLER, which is the German version of the drink. (Never tried it, but it seems like an abomination to me.) I was prepared to grumble about JITNEY because I thought it was more of a local/regional thing, but looking it up, I guess it’s LEGIT. I’ve never heard of it outside of crosswords though. Anyone else? Cluing was tougher than it’s been so far this week, as you’d expect. I like 14A [Miss Prissy of Looney Tunes, for one] for HEN, 22A [Street walker, on signs] for PED, 25A [Pan handler] for CHEF, 29A [Hippy performance] for HULA, 37A [You’ve got that right] for FREEDOM, and 52D [Wilson or Coolidge] for RITA which had me thinking Presidents at first. Nice! Simple theme, but well executed—a great grid with lots of goodies. I was expecting something in the style of Ambrose Bierce’s “The Devil’s Dictionary” and I wasn’t disappointed. 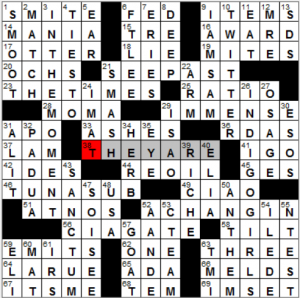 I’m not the biggest fan of quote crosswords like this, but the rest of the fill in the puzzle was pretty good. OMOO (61A), some otherwise common fill, got a nice clue as “Melville ode to cows; scratch that, I mean novel”. I liked after trying to figure out a common disease like the FLU, it turns out the “Constant concern for new parents” at 5D is POO. 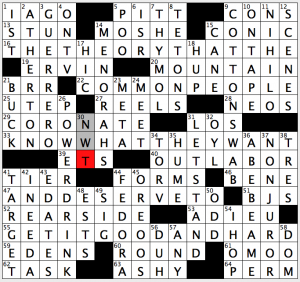 23A‘s “Puzzle within a puzzle” is a cinch for anyone that does Matt Gaffney’s puzzles or the MIT Mystery Hunt (or both, like your reviewer) – that’s a META. Finally, I think of “Red Bull, for one” (26D) as an energy drink rather than a POWER DRINK – that wording felt just a little odd to me. A straightforward puzzle with a clever quote and some pretty good fill. 3.5/5 stars. Good morning, everyone! 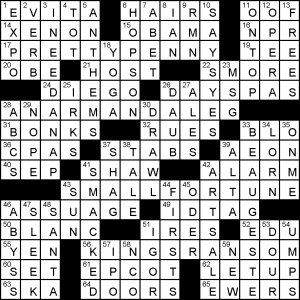 Today’s crossword, brought to us by Mr. Alan Arbesfeld, allows us to take some time out and have fun with a crossword…literally. Each of the four theme entries are puns, in which phrases are altered by excising one word, which also happens to be a period of time. GLASS FIGURE (17A: [Corning gift shop purchase?]) – Hourglass figure. TWENTIETH FOX (29A: [Last of a score of sly creatures?]) – 20th (Twentieth) Century Fox. THE SEVEN ITCH (48A: [Result of Snow White’s helpers getting poison ivy?]) – The seven-year itch. A AT THE RACES (65A: [Oakland ballplayer visiting Churchill Downs]) – A Day at the Races. Anyone in the journalism business that can recall the last time you, or your company, had to use a MIMEO (69A: [Old copy machine])? I know in the back of the office I used to work in, there was a vintage mimeograph just sitting there. Guess having it there spruced up the joint! 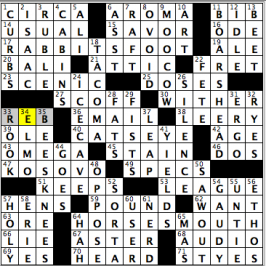 Well, I’ll now be on the lookout for more “mimeo” entries since I could have easily put down “Mineo” if I had not seen the clue in a rush to solve faster. I’m pretty sure I’ve never used RUDER ever before, so seeing that made me do a double take (15A: [Less tactful]). I’ve never had to make comparisons of people and had to judge which person is ruder. Not too much more too add for today, unless I wanted to have a LATE LUNCH today and wanted to keep talking about the grid (36D: [It may result in not being hungry for dinner]). “Sports will make you smarter” moment of the day: CLUTCH (58A: [Manual transmission pedal]) – After the Houston Rockets won back-to-back NBA championships in 1994 and 1995, the team ended up garnering the nickname “CLUTCH City,” a term that originally was a re-take on a 1994 Houston Chronicle article, “Choke City,” ran after the Rockets lost the first two games of a playoff series in 1994 against the Phoenix Suns. The Rockets won that series, went on to win the title in 1994, then repeat in 1995. 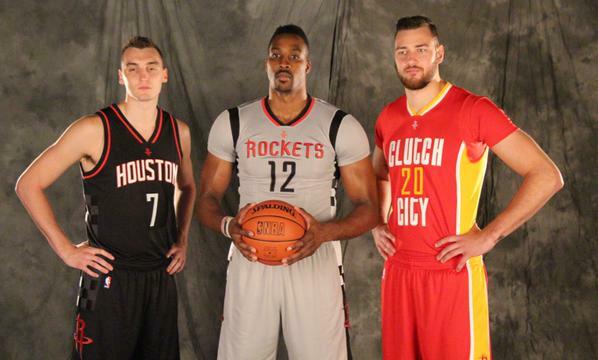 The nickname is still such a fabric of the team’s identity that they now have alternate uniforms that say “Clutch City” on it, a look that debuted this season. Not much to comment on in the rest of the puzzle. It’s a quiet and most clean grid. BEAUGESTE is about as wild as things get. [Hardly a miniature gulf], ABYSS is a clue I enjoyed, but mostly the clues were pretty button-down. I knew it was going to work like that when I encountered the clue [Noble gas], XENON but I don’t like it. It’s like clueing NIXON as [President] or BED as [Furniture]. If you go to Monday’s BuzzFeed crossword page, you can enter your email address to sign up for the BuzzFeed Puzzles Newsletter. You get an email with links to download the .puz or .pdf file, plus a nice note from editor Caleb Madison. An excerpt of today’s newsletter: “Paolo continually sends me themeless grids that make my jaw drop both because of how many cool answers he crams into them without making the rest of the puzzle obscure and because of his endearing style of cluing. Many solvers don’t realize that on the other side of the grid there’s a person who has spent a ton of time handpicking which answers go in the grid and what the tone of the clue is; solving a puzzle is really a personal experience.” Suitable for crossword buffs, no clickbait-style text! On to the puzzle. Grid highlights include MOSH PITS, MANSCARA (though I can’t imagine anyone who knows anything about makeup would think [Guyliner] and mascara are remotely the same thing—eyeliner is drawn or penciled on around the edges of the eye, whereas mascara is brushed onto the eyelashes—methinks the BuzzFeed copy editor is a clueless dude), DEETS (as in details), FREESTYLE RAP (perfect in a “freestyle” crossword), “COOL STORY, BRO,” GO STEADY (I assume nobody in Paolo’s teenage demographic actually uses this phrase), “USE THE FORCE,” SKYMALL (though the clue needs to be in the past and possibly future tense—it hasn’t been publishing for nearly a year), RUPAUL (nice clue: [Entertainer whose Twitter bio is “You’re born naked and the rest is drag”]), and SPIDEY-SENSE. I am, however, troubled by the inclusion of MOP in the same grid as MOSH PITS, because immediately my mind went to “mop shits.” Really smooth fill overall, which is great to see in a puzzle with this amount of zippy stuff in it. Never heard of 15a. [DJ who won a Grammy for his remix of John Legend’s “All of Me”], TIËSTO, though at least that’s more interesting than verb phrase TIES TO. Irksome misspelling in a clue: 64a. [Grafitti’s is the world], MUSEUM. People! It’s graffiti, two F’s, one T.
60d. [Like the name “Bookman” for a librarian], APT. 23d. [Worry, about how a slow-cooked dish of meat and vegetables will turn out, perhaps], STEW. Most irksomely under-punctuated clue: 40a. [Bird that lost its ability to fly and went extinct haha so stupid], DODO. 13-Down is also crying out for a comma before the last word: [Deck that people in horror movies always play around with, because that’s how you avoid getting possessed yeah]. This entry was posted in Daily Puzzles and tagged Adam G. Perl, Alan Arbesfeld, Bruce Haight, Byron Walden, Greg Johnson, Paolo Pasco. Bookmark the permalink. There were several things that fascinated me about today’s NYT. As the review says, it is a well-constructed, straightforward anagram puzzle, quite easy because the word “times” is so short and easy to anagram. One could say that it illustrates the point I made yesterday about puzzles that are heavily dependent upon knowing one reference — except that Dylan’s “Times are a changin’ was essentially a national anthem for several years. I didn’t know that the cover was called “Flogging Molly” though, and I don’t what that means, or who Molly is. I was startled to have the whole Scooter Libby – Valerie Plame episode brought back to mind (56a). I’m not sure that the expression “Ciagate” was as commonly used as “Watergate” or “Irangate,” but it would be hard to invent a story with such rapidly shifting, Byzantine, maze-like complexities. The Cia gate story was interesting, if nothing else. Bruce, Flogging Molly is a band, and one of many artists that have recorded covers of the song at some point. The sheer number of cover versions is a testament to the song’s fame, but it was still before my time. Today’s NYT had a good theme, but it was the epitome of an old-style grid filled with Crosswordese, the likes of which I wish would be deemed not yet fit for publication. Sure, the theme was constraining, but, in my opinion, if you consistently have to rely on partials (IMAT, IGO, ILEDE), plurals of abbreviations that can’t really be pluralized (ATNOS, RDAS), abbreviations and people that have mostly faded into obscurity (ISAO, SDS), etc., then you need to start over and rework things. With a bit more polish, or perhaps a page 1 rewrite, this puzzle could have been really good. Given that there are 720 different ways to arrange the six five-letter answers, I wouldn’t even call it constraining. Also, there are many different viable grid patterns and many different places the theme answers could go. We haven’t had a Bob Klahn puzzle in almost 2 months. I seem to remember he had health issues last year. Has anyone heard if the maestro is okay? Bob Klahn’s wife died recently. I was going to ask the same question about Bob Peoples. For a couple years, he produced one excellent Fri. – Sat. level puzzle after another, then he basically disappeared. Does anyone know anything about him? 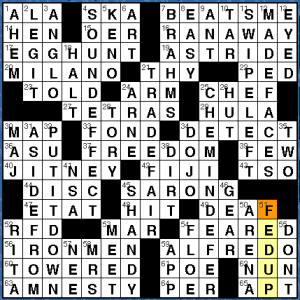 In today’s wsj, I could not figure out why “fed up” (51d) was a hint to various starred answers. I won’t set forth the starred answers (most of them long) so as to not spoil it hopelessly for anyone who has not done it, but since I didn’t understand it, I found it difficult, though I did eventually finish it. Probably the fault is entirely mine. thanks — got it. I tend to ignore orthography and think only of meaning. 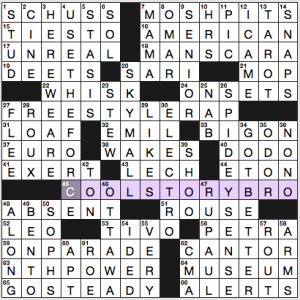 I’m happy with the NYT theme today and liked the puzzle. I guess I don’t mind large amounts of crosswordese that I know, but I really dislike 21a SEE PAST paired with 47d SO I SEE. Just going to let the clue/answer to 51-Across in the AVCX puzzle slide, huh?